Lyon: Jean Temporal, 1556. First edition in French. 341 x 218 mm. Two volumes in one. 3 woodcut maps and 36 woodcut illustrations in contemporary colouring. Map of Africa, oriented upside down. Vol. 2, p. 25: Personification of Arabia. Vol. 2/2, p. 294: Map of the Nile. Early printed book. First edition in French. 341 x 218 mm. – Two volumes in one. ff. , pp. 495 [recte 499], ff. ; , pp. 160, ff. , pp. 70 [recte 71], 307. – Two titles with illustrated woodcut border, one woodcut publisher’s device, 36 woodcut illustrations, and 3 woodcut maps (1 double-page repeated), all in contemporary colouring, except for 1 small uncoloured diagram. The geographer ‘Leo the African’ was born as al-Hasan ibn Muhammad al-Wazzan al-Fasi (c. 1494-c. 1554) probably in Granada, but soon after the family moved to Fez (modern-day Morocco), where he studied law and theology. As a young man, he began to travel widely in North Africa, Turkey, Arabia, and other countries, even crossing the Sahara and reaching as far as Timbuktu. In 1518, while returning from a journey to Egypt and Arabia, he was captured in the Mediterranean by Christian pirates and eventually handed over to the Pope. He agreed to convert to Christianity, and, in 1520, al-Hasan ibn Muhammad was baptized and received the name Johannes Leo de Medicis after his noble patron, Pope Leo X (Giovanni de’ Medici). According to Leo Africanus himself, he completed the description of Africa by 10 March 1526. The first edition was published in Italian. It appeared in May 1550 in Venice, published by Giovanni Battista Ramusio within his collection of travels and discoveries, Delle navigationi et viaggi. The present, first French edition was translated by the Lyon publisher Jean Temporal. Leo’s work comprises pp. 1-394 of the first volume. It is the principal text of the book. Temporal added further translations of several other travel accounts from Ramusio’s collection, mostly regarding Africa, but also voyages to America by Amerigo Vespucci, and to Asia by Vasco da Gama. 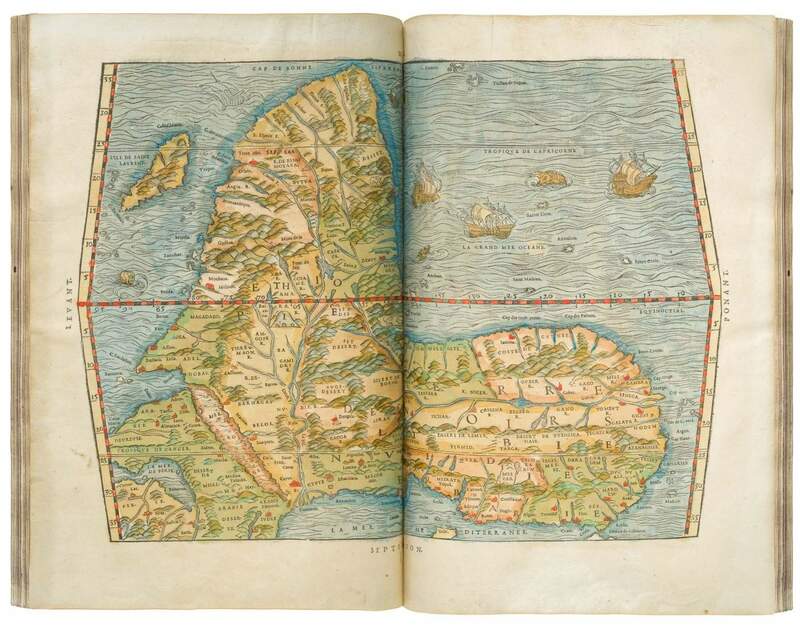 Each of the two volumes carries the same double-page woodcut map showing the entire continent of Africa, including also the majority of the Arabian Peninsula. The illustration of the text includes 19 large woodcuts depicting various inhabitants in their respective costumes, warriors with their arms, a man riding a camel, another on horseback, dancing women, etc. The work is very rare in commerce and the present copy is exceptional with its illustration coloured by a contemporary hand. A fine binding and a continuous provenance from a French noble family add to the magnificence of the present copy.